The first time the Runner spends click to gain 1credit each turn (not through a card effect), gain 1credit. "The customer pays to use our service, and then the advertisers pay us to put ads on their screens, and then the customers pay us a premium to remove the ads. Welcome to the dream." When does the runner click for credits? When the runner needs money and doesn't have any better way to get it. Usually, but certainly not always, that means they're trying to get credits to install or play a card that will get them more credits. CPC Generator lets you capitalize on a runner who's economy is down to gain a maximum of 1 per turn. Before you think it's a good deal though I present PAD Campaign which gives you 1 every turn regardless of what the runner does. Sure CPC Generator is 2 cheaper put it's also 2 easier to trash (not that it's going to be a high or even middle priority target). If the runner's economy engine is running well CPC generator won't help since the runner won't click for credit. If the runner needs to click for credit chances are you're already winning as a corp and don't need the little trickle of money. And since it's likely the runner will get on their feet within a few turns or so you're unlikely to make more than 3 or so from a CPC Generator. Kinda underwhelming. Maybe there are combos that CPC Generator works in? The obvious thing to look for is the keyword advertisement. There are currently three cards that mention that in their text: Ad Blitz, Rebranding Team, Spark Agency: Worldswide Reach. Rebranding Team just gives all assets advertisement, it doesn't do anything for assets that already have it. Ad Blitz is potentially interesting to mass install advertisements but at 1 per install and rez of CPC it's not a great deal. Spark Agency: Worldswide Reach is the most interesting of the three and the only one in which CPC Generator makes a little bit of sense as it'll cost the runner 1 when you rez it. I guess you could try to use some kind of weird deck with Test Ground to repeatedly derez and rez a CPC Generator, but that's a load of money and clicks for very little impact. If CPC Generator would trigger every time the runner clicks for credit maybe it would be a somewhat better card, but even then it's likely to be eclipsed by the standard Pad Campaign in terms of net profit. This is another one for the "what were they thinking?" collection. This is a Spark card, through and through. 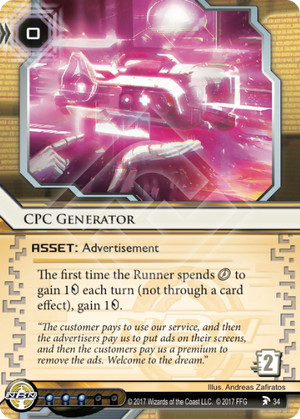 If the Advertisement didn't give it away, CPC Generator rewards you for doing what you want to be doing in a Spark deck: denying the runner money. CPCG helps to distance you from the runner economically: the rez lowers them a cred, and it gives you money while the runner tries to bounce back. The cost is low, but the rez cost is free, so that trade off isn't terrible. Also, if you're successfully keeping the runner poor, then a and 2 to trash this is relatively expensive for the runner. You could argue that the runner controls when and how often the ability fires, but clicking for creds is already an action most runners try to avoid like the plague. You'd want CPCG in decks where you're forcing the runner to click for creds. This would be an excellent target to protect with a Special Offer: you rez it at the end of your turn to drop them a , then they run it on their turn, you rez Offer to drop them a , then you net 4 and they trash CPCG for 2. They lost 4 and a , while you gained 4. Sweet. If you're using CaPaCaGa to win the econ race, you'll want to leverage that to help you win. Anything with a trace is good, like HHN, Enforcing Loyalty, or Beta Cat (a fav card of mine). Or you can just build up your board state while they struggle to keep up. Big ice like Tollbooth is always a good choice, especially if you're doing the pseudo-glacier. I don't see this finding a home outside of Spark, but that's okay. Niche IDs often have pet cards, and CPCG appears to be one of Spark's.